Photo on the internet of very interesting ancient machinery which has not yet been identified, so we had a go ! -- This one has engendered a bit of debate as a previous picture of the same car we identified as a Corre. It looks similar to a Ceirano and also to Fouillaron and a Renault. No known connection with Ceirano, but Fuillaroin and Corre were joint directors of a company making quads but also selling Renaults. 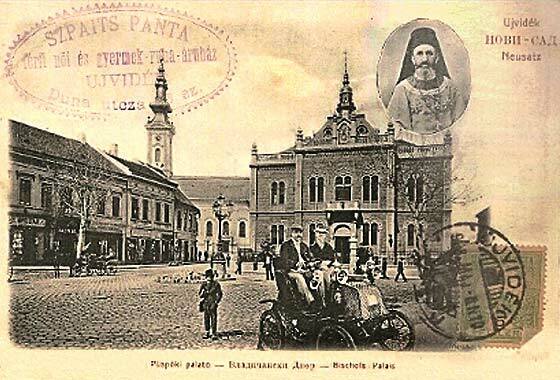 Almost identical so this could well be a Fouillaron-Corre badged 1900 Renault C.
Postcard photo received from Velibor Nisevic of Novi Sad (Serbija), researching automobilisim in Vojvodina before WW1. 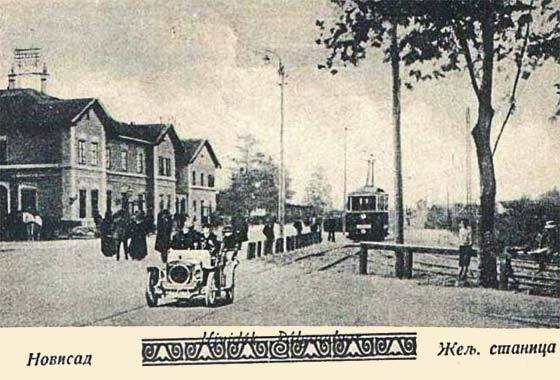 He believes photo was taken post 1911 as it has a tram in it ! -- Seems the original photo has been flipped and possible the car was superimposed. 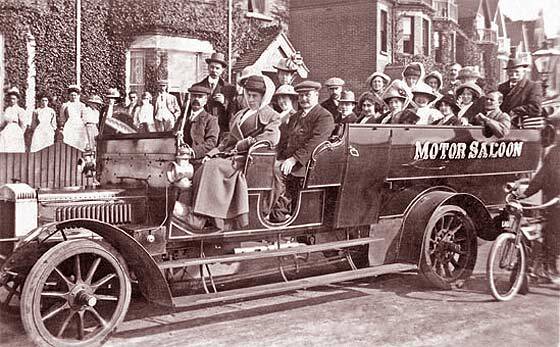 The car is very curious because the shape of the radiator with a circle indicates the car was made in Coventry England, and is a cca 1907 Singer 12'14hp Tourer. When flipped correctly, the car seems to have British registration. Lovely photo received from Leyland expert Mike Sutcliffe (UK) asking if we can help with this photo. Happy to help him where we can, as he frequently helps us. 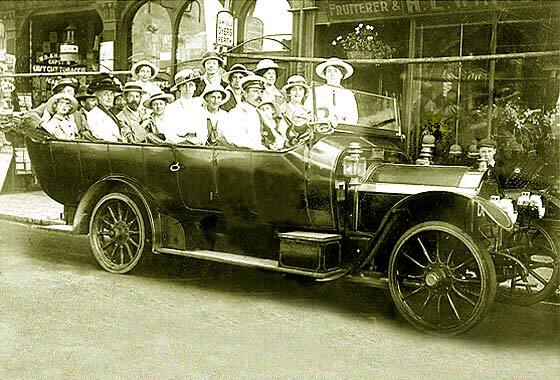 -- We are relatively sure the vehicle is a French cca 1908 Lorraine Dietrich Charabanc. For 1908, De Dietrich offered a line of chain-driven fours, the 18/28 hp, 28/38 hp, 40/45 hp, and 60/80 hp; this at at the upper end of the HP band. The British version had shaft drive. That year the company name was changed to Lorraine-Dietrich. Surfing through the internet in attempting to identify old vehicles we often come across photographs or old Postcards, including those on Rootschat and those for sale on Ebay, of very interesting ancient machinery which has not yet been identified, so we have a go ! -- Quite interesting photo of a very grassy road in front of a then quite modern house. Quite basic car body. This is cca1907 Wolseley Siddeley Tourer. 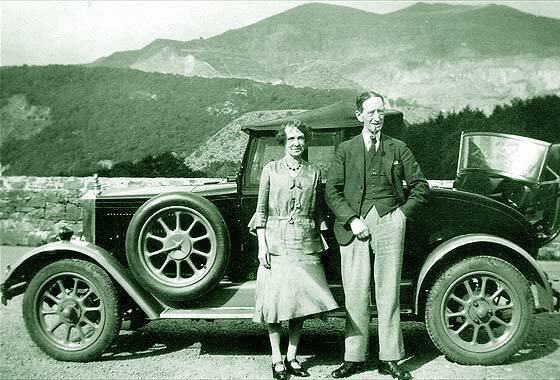 Herbert Austin had recently left, '05, to form Austin Motor Co.
Lovely photo received from Tom Miller (UK) advising it was taken in front of his ancestor's family home in Dudley Road, Brierley Hill. 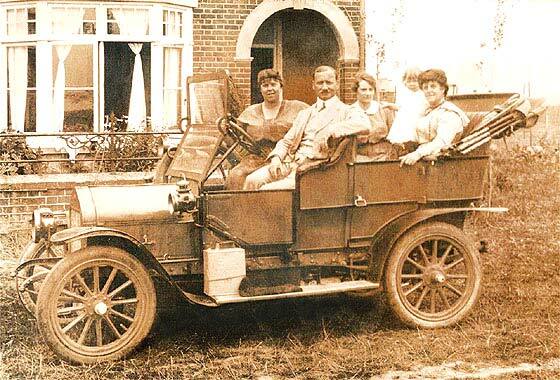 The man in the driving seat was his great great grandfather, Thomas Gould, a well-known businessman in the area and believed to be the first man to own a car in the town. 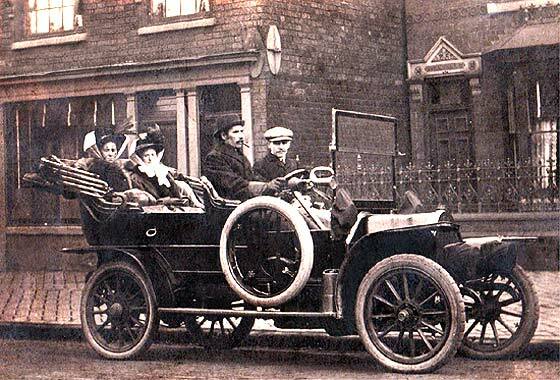 -- Made in Manchester by first local car maker Marshalls who started 1897. Changed name 1903. Flat scuttle so this is a cca 1909 Belsize 14'16 Tourer, 2543 cc 4-cylinder, made 1909 to 1913. Lovely photo received from Leyland expert Mike Sutcliffe (UK) asking if we can help with this photo. Always happy to help him where we can, as he frequently helps us. -- Originally declared as an Unknown, subsequent searches confirmed first thoughts of Daimler charabanc based on a car model rather than lorry version with the peaked rounded Daimler commercial rad. Detail of the bonnet and the fittings have same features as found on the big Daimler cars of cca 1910, poss 40hp. 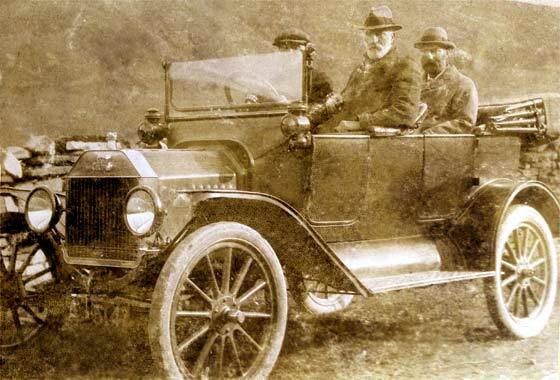 Interesting photo received from John Place (UK) asking if we can help with this photo containing rear passenger, grandfather James Place. Is it a Ford Model T Touring of 1916? -- Seems British registration AJ 5147, North Riding of Yorkshire CC, but no dating info. The car is indeed a Model T Ford on the changeover 1915 / 1916 with many '15 features and many early '16 features. Electrics, front wing 'bills', formed cowl, windscreen; in view of the angular bonnet, we are going for late 1915. 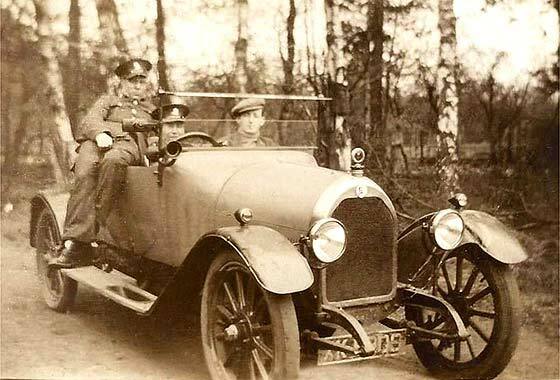 Couple of interesting photos received from Dan Mooney, Austin, Texas (USA), this one showing his British grandfather in the passenger seat of a car in the late 1920s. -- This vehicle carries an unclear London County Council registration of 1922. The vehicle was manufactured by a French company in Paris, with offices in the UK, which became British owned during this period. Badge shows its French origin. 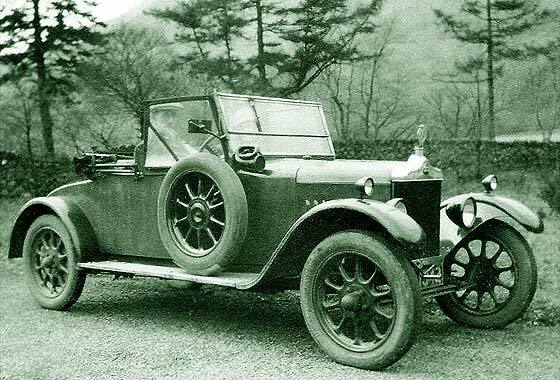 Corrected model information, it is cca 1922 Darracq 12 Tourer. Became Talbot Darracq. 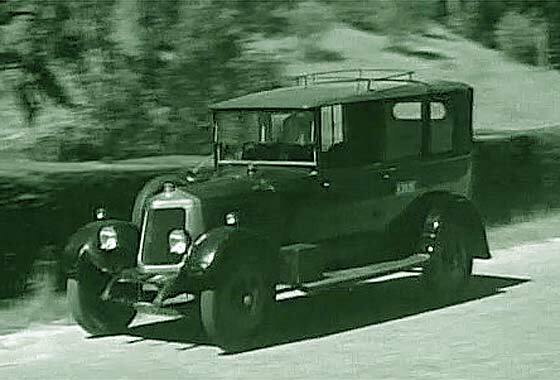 Cinema screen grab taken from an American film 'Three Commrades' made in 1938, where cars are being investigated by IMCDB. Film is about three German WW1 soldiers post war in love with same woman dying of tuberculosis. -- This is a big car and isstrangely for this film, British. This is a cca 1923 Armstrong Siddeley 18 Carlisle Three-Quarter Landaulette. 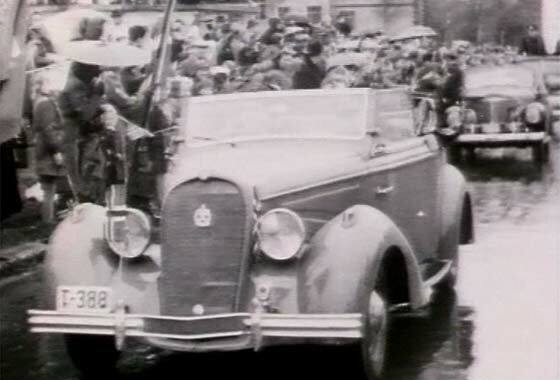 The 18 came in short and long chassis and on this car the chauffeur sat out in the cold as was an "open drive" car. Cost £540.00. Surfing through the internet in attempting to identify old vehicles we often come across photographs or old Postcards, including those on Rootschat and those for sale on Ebay, of very interesting ancient machinery which has not yet been identified, so we have a go ! -- This one is of a car made in Turin, Italy, by the Fabrica Italiana Automobili Torino which was founed 1899 and had a factory in the USA in 1908. 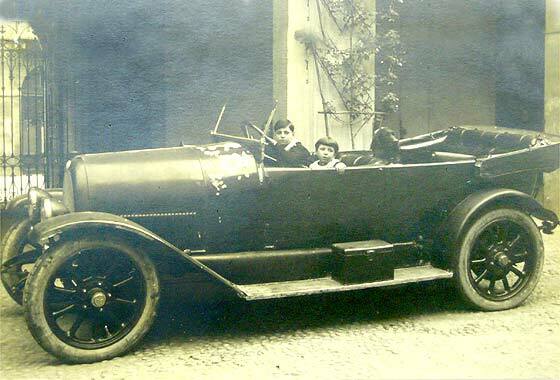 Popular car in Italy, a cca 1923 FIAT 501 Torpedo. 47,000 made '19-26. One of three photographs posted by Iksrognas (UK) on the Rootschat website saying that all were taken in Wales in the 1920s. Can anyone tell the make and model of the cars. --Suggested this was a Standard; indeed a Standard. No registration letter visible to aid dating. From the position of the headlamps this is a cca 1924 Standard 11hp Two-Seater. There were a number of variations on the 11hp chassis, but position of headlamps and the flatness of the bonnet helps to confirm the dating. One of three photographs posted by Iksrognas (UK) on the Rootschat website saying that all were taken in Wales in the 1920s. Can anyone tell the make and model of the cars. --KU 6181 is Bradford County Borough Council. 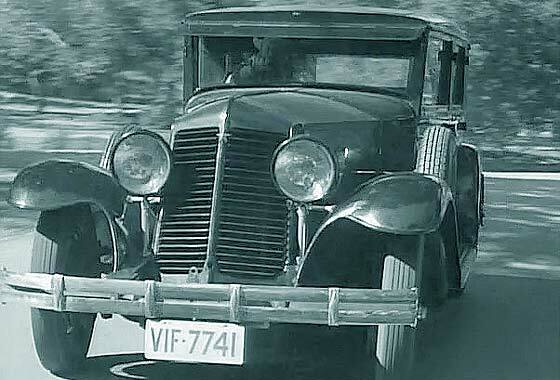 From the grainy photo it is possible to mistake it for a Morris Bullnose, but this car is foreign. This is a cca 1924 Citroen Model C Cabriolet. Although Citroens had been imported UK since 1919, Citroen opened own office in London in 1923 and later factory in Slough in 1926. 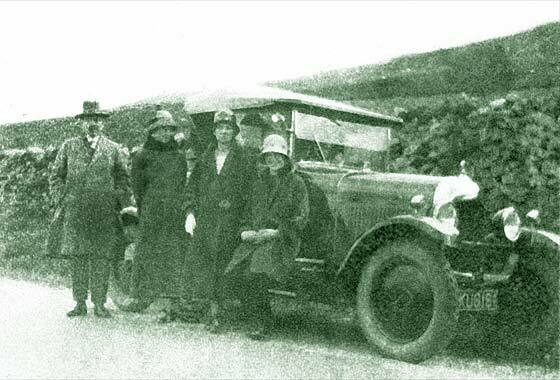 One of three photographs posted by Iksrognas (UK) on the Rootschat website saying that all were taken in Wales in the 1920s. Can anyone tell the make and model of the cars. --This car is a cca 1928 Morris 'Flatnose' Cowley Two Seat Tourer. No registration letter visible to aid dating. It seems to have the optional front brakes. These were made 1926 to 1931. The car in the photo carries a very interesting second windscreen with a weatherproofing lower cover for the dickey seat. Cinema screen grab taken from an American film 'Three Commrades' made in 1938, where cars are being investigated by IMCDB. Film is about three German WW1 soldiers post war in love with same woman dying of tuberculosis. -- This is a big car and is French, a cca 1928 Renault Reinastella RM Saloon. Not initially successful because of having a rad at front, rather than back. This car has the star on rad low down, indicating first year, but the big diamond Renault sign is missing. 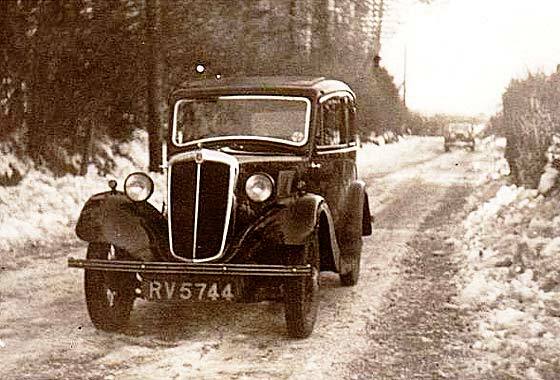 Photo passed to us by our Registrar Peter Clark (UK) asking if we can find out what this car could be. Guesses had been made that it migh be a Peugeot or an Opel. -- Quite uncommon cca 1933 American Austin Sedan, 747cc, 50mph, 40mpg made by American Austin Car Company in Butler, Pennsylvania, licensed from the UK Austin Motor Co. Made 20,000, bankrupt by 1934, bought by employee, renamed American Bantam who made 7,000 cars to 1941, then designed prototype Jeep!! Surfing through the internet in attempting to identify old vehicles we often come across photographs or old Postcards, including those on Rootschat and those for sale on Ebay, of very interesting ancient machinery which has not yet been identified, so we have a go ! -- This one looks a bit like a Ford Model Y Ford but is a cca 1935 Morris Eight two Door Saloon, subsequently known as as the Series 1. It had a 918cc sidevalve engine of 24BHP, three speed gearbox and hydraulic brakes. Cinema screen grab taken from a long running series of Norwegian news bulletins, this one made in 1947, where cars are being investigated by IMCDB. Bulletins are on everyday events in post war Norway. -- The make is recognisable by the two crossed cannons which signify the company's original occupation; arms manufacture. American Benjamin Hotchkiss came from USA to Paris in 1875 and made cannons. 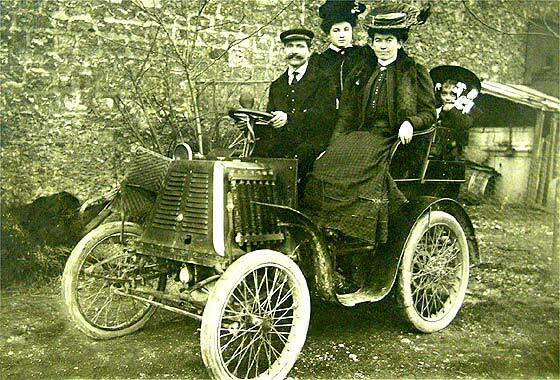 First car made in 1903. This is a cca 1936 Hotchkiss 480 Cabriolet. Closed 1971. Interesting period photo received from regular contributor Bill Stothard of the Cudworth Local History Group (UK) asking if we can again help with this photo. He knows commercials are not our specialty. -- He is right, - but we are relatively sure we know what it is. Registration CWE 76 is Sheffield CBC of July 1936, Cudworth being nearby. 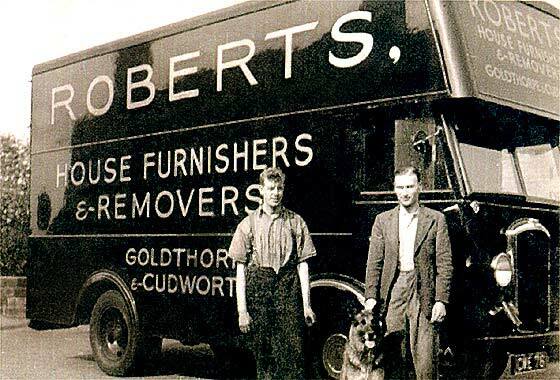 The Furniture Van has the tell tale blob on the right front which is the exposed steering box making it c1936 Dennis Ace 40'45 Box Van. 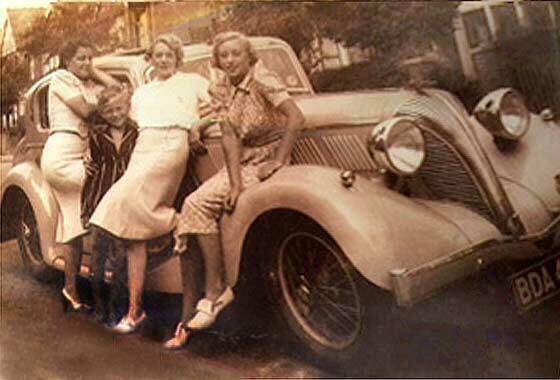 Glam photo received from Tom Oakley (UK) advising he is trying to identify the the car for his father. He recently lost his mother who is on the right and Tom would love to settle his curiosity. -- Upmarket automobile carrying a Wolverhampton CBC registration. Dating is from the numberplate and from the slanting four sets of louvres. This is a cca 1937 Triumph Dolomite 14'60 Sports Saloon made in Coventry. Car was design by Donald Healey and the waterfall grille by Walter Belgrove. 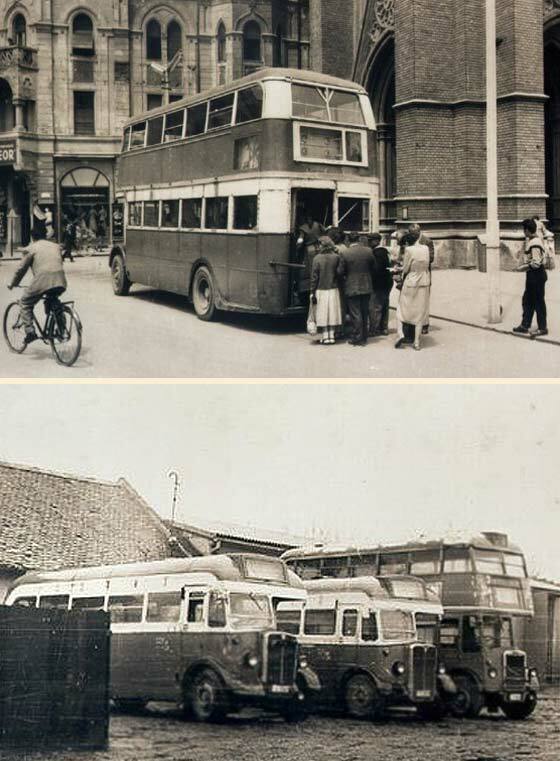 Photo received from Velibor Nisevic of Novi Sad (Serbija), saying these 'Londoners' were used locally in 1952 and were described as Leylands purchased from London Transport. -- Very interesting rear door not normally seen on UK busses. Additional door/s on the 'offside' suitable for driving on right. Mike Sutcliffe advises this is a cca 1938 AEC Regent STL, and that single deckers on other photo were cca 1937 AEC Regal Type T and that doubledecker shown on right was cca1947 Leyland PD1. 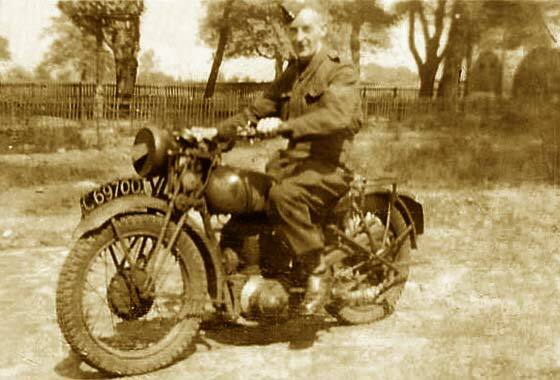 Couple of interesting photos received from Dan Mooney, Austin, Texas (USA), this one showing his British grandfather riding a motorcycle during WW2. -- This vehicle carries a British Army registration of 'C' for motorcycle. Our motorcycle experts confirm this is a cca 1940 BSA M20. BSA and Norton were suppliers of motorcycles to the War Office in WW11. The BSA M20 became the leading service model 1937 to 1955; 469cc single cylinder side valve, speed 55 - 60mph. Over 125,000 made. 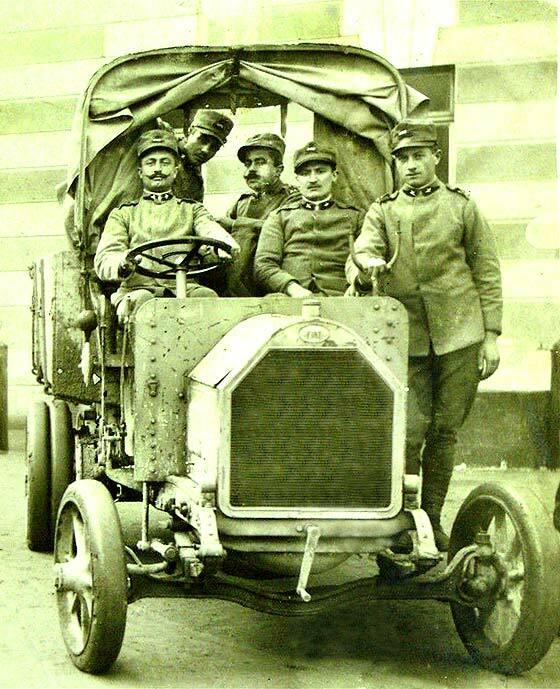 Couple of small fascinating photos received from Velibor Nisevic of Novi Sad (Serbija), researching automobilisim in Vojvodina before WW1. He has doubts about some of the information available and believes that the first car in Novi Sad was a 1901 De Dion Bouton. What is this vehicle? -- Car looks superimposed on postcard. Photo is very small and blurred so not possible to pull out details for identification. Very tall bonnet and long dumbirons. One of the less known European makes. Lovely photo received from Leyland expert Mike Sutcliffe (UK) asking if we can help with this photo. Always happy to help him where we can, as he frequently helps us. -- However, in this case we find that we cannot get a match for this vehicle. 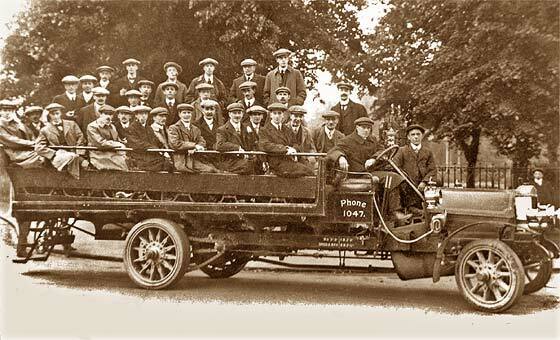 The charabanc is actually very basic and seems to be a WW1 lorry fitted with longitudinal benches. 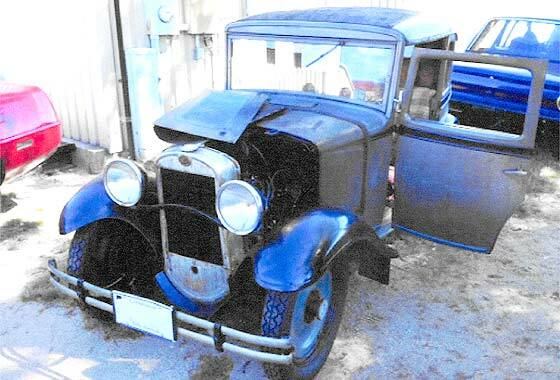 Normally bodies would be made by others so identification of chassis depends on bonnet and radiator. Sloping bonnet should help. Any Help Welcome ! Frustrating set of photos received from Jeff Demuth (USA) asking if someone tell what car this was? Thinking late 1920's, possible a truck back in the 1940'. 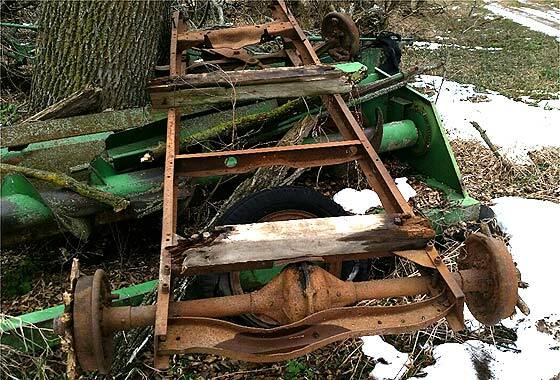 When grandfather bought farm it was already there and he used it as a wagon for a time. All the rims are tires are present, brake drums and rear differential turn freely. Letter "D" on the differential. Hate to scrap if any good. -- Regret too specialised for us so we suggested he contacts the AACA. Any help would be welcome !